This article is about the generic enemy. For the recurring character occasionally called Magikoopa, see Kamek. For the red, propeller-using variant sometimes just called Magikoopa, see Toady. Artwork of a Magikoopa from Super Mario 3D World. 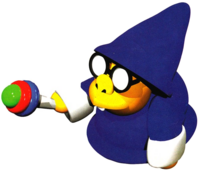 Magikoopas (referred to as Kameks in Japan and certain English localizations, and also referred to as Koopa Wizards in the Super Mario World television series) are bespectacled Koopas that can cast spells. Magikoopas made their debut in Super Mario World. They wear blue robes and hats resembling the garb of a wizard. They are generally considered to be high ranking members of the Koopa Troop, and some act as personal advisors for Bowser. Kamek, a lead Magikoopa, appears in several installments of the Yoshi franchise. He is usually the main villain or assistant to the main villain. Kamek is the only Magikoopa that appears in the Yoshi games. Lone Magikoopas appearing in other games are often said to be Kamek. Occasionally, Kamek is actually intended to be the character in question, but is called plain "Magikoopa" due to the fact that "Kamek" is also the generic name for the species in Japanese. An example of this is Mario Party 9, where Kamek is called by name in the PAL region but is called "Magikoopa" in the North American version. However, this also works in reverse, meaning that Kamek in said British English versions is a generic Magikoopa, as seen in Super Mario 3D World. A Magikoopa's artwork in Super Mario World. Magikoopas first appear as enemies in Super Mario World. In this game they mainly appear in fortresses and castles, where they pop out of thin-air and shoot magic at Mario or Luigi. Their magic blasts have the power to turn a Rotating Block into a yellow Koopa Troopa. The magic blasts come in the forms of shapes: a circle, a triangle, and a rectangle. These magic spells hurt Mario if he touches them; however, he can safely Spin Jump off of them. It is also possible to cancel out the spell with a cape spin. 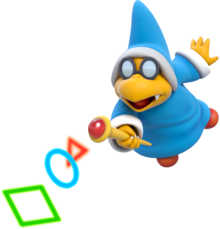 The circle, triangle, and rectangle have become recurring elements in spells cast by Magikoopas in later games. Magikoopas are immune to fireballs. Along with the Chargin' Chuck, the Magikoopas seemed to have replaced Hammer Bros. as the elite forces of the Koopa Troop in this game. Magikoopas have a unique palette from other enemies in this game, with more yellow skin and a darker blue than other blue enemies. However, the palette is arranged incorrectly, causing the darkest shade of blue to display where the lightest should. In Super Mario Advance 2: Super Mario World, this unique palette has been replaced by the regular blue palette, and as such is mapped correctly. Despite the fact that they do not appear as normal enemies in Super Mario World 2: Yoshi's Island, this game marks the debut of their leader Kamek, who is the main villain of the game. In the hallway before Baby Bowser's room, Kamek acts as generic Magikoopas do in Super Mario World. He does this again in Yoshi's New Island, again before Baby Bowser's room. Although absent in the original Super Mario Bros. 3, Magikoopas appear in the e-Reader level Bowser's Last Stand in the Game Boy Advance remake Super Mario Advance 4: Super Mario Bros. 3. They behave similarly to those in Super Mario World, transforming Brick Blocks into green Koopa Troopas. Occasionally, their spells will backfire and produce a Super Mushroom instead. Artwork of a Magikoopa from Super Mario Galaxy. In Super Mario Galaxy, Magikoopas, behaving much like they did in Super Mario World, are found on many different worlds and Airships; as always, they attack using magic. Magikoopas, when defeated, always drop a coin. A single Magikoopa, said to be Kamek by a Super Mario Galaxy trading card, makes a brief appearance in the opening scene: he attacks Mario trying to rescue Princess Peach and sends him flying into space. A large Magikoopa named Kamella is also introduced as a boss; she is fought up to three times when Prankster Comets are included. Magikoopas also appear in Super Mario Galaxy 2. Like in the predecessor, they use magic to attack. They can either conjure up enemies (Goombas and Li'l Cinders) or fireballs from the previous game. It is shown in Bowser's Galaxy Generator that Yoshi can eat the Magikoopas, and they'll actually leave three Star Bits instead of one coin. Magikoopas reappear in Super Mario 3D Land, looking and acting as they do in the Super Mario Galaxy games, but they do not summon enemies. One takes the form of a Tanooki-tailed fake Bowser. Magikoopas returned in Super Mario 3D World, retaining their strategy from Super Mario 3D Land. They also have their own Enemy Battle, Magikoopa Blockade. Defeating a Magikoopa rewards the player 1,000 points. They are called "Kameks" in European versions of the game due to the differences between regional localizations. Magikoopas reappear as enemies in Super Mario Maker and Super Mario Maker for Nintendo 3DS. They function the same as before. In the Course Maker, they can be placed as enemies, and if they are part of a stack, they will not teleport. Like many objects, they can be enlarged by a Super Mushroom and be given wings, the latter of which causes their projectiles to create winged objects when they hit a block, if applicable. If enlarged, they can make the object turn into a giant version of it. Shaking them has no effect, and they can be placed in Warp Pipes, Bill Blasters, and Blocks. In addition to transforming blocks, their shots can also make Goal Poles and Axes disappear, after which the Magikoopa that shot them must be defeated in order to bring said goals back. Also, they can be defeated by Mario's fireballs. In the Super Mario World style, they are slightly smaller than in the original game, their wand's jewels have a shaded outline around them, and the palette is mapped properly, unlike in the original. The palette has a similar yellow skin to the original, but the blue is more vibrant. 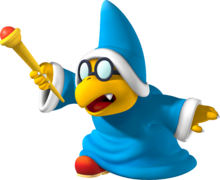 A Koopa Wizard, from the Super Mario World episode "The Yoshi Shuffle". Magikoopas, here renamed Koopa Wizards, made various appearances in the Super Mario World television series. The first Koopa Wizard introduced was a character named Wizenheimer, who was said to be the strongest of his species. He appeared in the episode "Ghosts 'R' Us". The first appearance of Koopa Wizards as a species was in the episode "Rock TV", where Bowser used several Koopa Wizards hidden in televisions he sold to hypnotize the inhabitants of Dome City. Near the end of the episode, Yoshi eats all the televisions of the cave-people and spits the Koopa Wizards hidden in them out, saying they tasted disgusting. A Koopa Wizard also appears in the episode "The Yoshi Shuffle"; after being knocked over by Luigi, the angry magician transforms him into an egg. This Koopa Wizard is eventually knocked backwards by a wayward stone football thrown by Yoshi. The last appearance of a Koopa Wizard was in the "Mama Luigi" episode, where one appears to attack Mario while he was exploring the deserted Dome City. Magikoopa appeared in two of the Nintendo Adventure Books, but there was only one, Bowser's third cousin twice removed. His magic powers mostly involved shrinking things. In "Flown the Koopa", he captures dinosaurs and shrinks them to put them into his TV as he does not have cable. In "Unjust Desserts", his magic is responsible for all of the shrunken Koopa minions invading Yoshi's body. Two unnamed Magikoopas were also featured in the Super Mario Adventures comic; one Magikoopa, similar to Kamek, was shown to be Bowser's second-in-command, organizing his wedding, among other duties. Another, elderly and mustached Magikoopa was also used by Bowser to brainwash Princess Toadstool and several hundred Yoshis. This Magikoopa is eventually defeated when it was trampled by the very Yoshis it had hypnotized. A single Magikoopa appears in Yoshi's Safari as the boss of Cornice Cave. This Magikoopa attacks Mario and Yoshi by teleporting around and shooting magic blasts; he can be defeated by being blasted in the face repeatedly with Mario's Super Scope. Mid-battle, he also makes himself larger and therefore more powerful, although the target of his face is also widened, making the remaining half of the fight somewhat easier. Magikoopa in Super Mario RPG: Legend of the Seven Stars. In Super Mario RPG: Legend of the Seven Stars, several Magikoopas make a brief appearance at Rose Way and Moleville Mountain as minions of Bowser. However, the Magikoopas, along with the remaining members of the Koopa Troop, have difficulty combating the Smithy Gang and are eventually nowhere to be seen when Bowser is met at Booster Tower. Kamek, under the name Magikoopa (or "Kamezard" in Japanese), is the one in the lead, and is later encountered in Bowser's Keep. The demo presentation of Super Mario RPG: Legend of the Seven Stars features a Magikoopa and an army of Terrapins in the Forest Maze fighting Mario and a crying Mallow, and shoots a magic spell that is blocked by Geno. This Magikoopa does not appear in gameplay. Internally, this Magikoopa is known as 「カメック」 (Kamek, its usual name) in the Japanese version and "Merlin" in the English version. Two Magikoopas (one riding a broom) in Paper Mario. Kammy Koopa is Bowser's right-hand minion in Paper Mario, and Magikoopas appear as rare enemies. One first appears in Shooting Star Summit, and they are later encountered in Bowser's Castle. They maintain their teleportation abilities in this game, appearing and disappearing randomly and making it easy for them to get a first shot on Mario. Some Magikoopas also ride broomsticks, and have to be knocked off before Mario can hit them with his Hammer. Many sub-species are also introduced in this game, but regular Magikoopas are the strongest, having all the powers of the sub-species, although the one fought on Shooting Star Summit does not appear to be a major threat. Magikoopas are once again enemies in Paper Mario: The Thousand-Year Door; however, this time they can be encountered much earlier. A trio of different colored Magikoopas can first be found in Glitzville, and standard blue Magikoopas appear later in Rogueport Sewers alongside Hammer Bros and Koopatrols after being scattered from a Superbombomb blast at the end of Chapter 5, replacing most of the enemies previously seen in Rogueport Sewers. They have the same battle plan as in the first Paper Mario, and also retained the ability to make "copies" of themselves. Once again Kammy Koopa is shown being Bowsers right hand minion. She is shown to have higher authority then the rest of them throughout the game often giving orders and participating beside Bowser in a fight. Magikoopas return in Super Paper Mario, starring in The Bitlands and Castle Bleck. They are also present in Bowser's Castle and the wedding chapel at the beginning of the game. Additionally, while still at Bowser's Castle, there is one generic Magikoopa standing by his side when he is giving his minions a motivational speech before they head off to kidnap the princess; this may possibly be Kamek. Also, in the Flopside Pit of 100 Trials, Dark Magikoopas, a subspecies of Magikoopas, are introduced. They shoot spells to harm the player and can be defeated by the usual stomp. However, even if the player stomps a Magikoopa, its magic attack generally is still launched. Magikoopas are seen either standing on the ground, or riding brooms overhead. Despite appearing in the last three installments, generic Magikoopas do not appear in Paper Mario: Sticker Star. However, Kamek makes his first official Paper Mario series appearance in this game. In Mario & Luigi: Superstar Saga and its remake, Magikoopas appear in Bowser's Castle, which had been hijacked by Bowletta. These Magikoopas attack Mario and Luigi by shooting large, spinning rings of fire at them and they would also boost themselves or other enemies' health or increase their stats. They appear on the Adventure Field. Magikoopas sometimes fight with Sniper Bills and Chomp Bros.
Psycho Kamek also appears in Superstar Saga. He lives in Little Fungitown, and hypnotizes Luigi into thinking he is Mario, thus making him brave enough to go on a daring mission to save his brother, who is sick with Bean Fever. He is replaced by Dr. Toadley in the remake. This game is also the debut of Magikoopas' modern white-brimmed caps. They are one of the few enemies in the game to not have stylized graphics. Magikoopas appear as enemies and recruitable allies in Minion Quest: The Search for Bowser. They are flying troopers, and they attack enemies from their broom. Like Red Magikoopas, Green Magikoopas, and White Magikoopas, they are weak against Bowser Jr. Although no normal Magikoopas appear in Mario & Luigi: Partners in Time, Kamek plays an important role as Prince Bowser's attendant throughout the story. He serves as a boss of the Yoshi's Island segment of the game, being fought prior to the brothers entering Yoob's Belly. In Mario & Luigi: Bowser's Inside Story, Bowser saves a group of imprisoned Magikoopas inside a cage in Princess Peach's ruined castle. After he rescues them, they'll teach Bowser a Special Attack called Magikoopa Mob, where he throws fireballs to the Magikoopa's wands to power their blasts towards the enemy. There are also enemy Magikoopas which resemble Fawful called Magifoofas. There is also a Magikoopa that helps Bowser after the player defeats him the first time (he also teaches him the punch and flame). There is also two (unless they're the same one) in the credits, and one that tells Bowser about the package Princess Peach sends. Magikoopas reappear in Mario & Luigi: Dream Team where they appear in the battle against the giant Bowser. Kamek makes an appearance as the secondary antagonist of the game, often appearing alongside Bowser and Antasma, as well as the Elite Trio. Magikoopas reprise their role as supporting protagonists in the main game, though none appear as playable allies in the game's side story featuring Bowser Jr.. The Character Selection Screen showing Magikoopa. A Magikoopa (possibly Kamek) was originally going to be in Mario Kart 64, but was taken out for unknown reasons and was replaced with Donkey Kong. In Mario Kart: Super Circuit, a lone Magikoopa (possibly Kamek) can be seen at the end of Bowser Castle 3. This Magikoopa appears only in the Super Circuit version, as it does not come back in the Mario Kart Wii version of this course. An unused emblem is present in Mario Kart 8's data that appears to belong to a Magikoopa (possibly Kamek), suggesting that at one point a Magikoopa was planned to be a playable character before being scrapped. In Mario Superstar Baseball, Magikoopas are playable characters, originating on Wario's team. They use their scepters as their bats, and Red, Green, and Yellow Magikoopas appear as alternate color schemes for the game's playable Magikoopa. In Mario Superstar Baseball, each Magikoopa has good fielding abilities, and some of them have average batting skills. However, all of them are very slow, and are poor pitchers. Magikoopas also appear in Mario Super Sluggers, but are part of Bowser's team instead. Like in Mario Superstar Baseball, they use their scepters as bats, and come in blue, red, green, and yellow variations. Unlike with the predecessor, though, their pitching skills have greatly improved, but their batting skills are weaker than before. They are still very good fielders, but their running skills are still very poor, with the Red Magikoopa having the slowest running skills (tied with King K. Rool). Magikoopas do not have good stamina, since they get exhausted rather quickly when they let up a few big runs. Ironically, the Red Magikoopa's bio states that it has good stamina, which contradicts with its actual pitching behavior. Magikoopas (known here as Kameks) appear during the boss fight with Giant Kamek in Super Princess Peach. Here they appear flying on brooms, sometimes holding crystals that can be stolen if the Kamek is defeated. In Mario Party 8, Magikoopas appear in Shy Guy's Perplex Express and Bowser's Warped Orbit. In Shy Guy's Perplex Express, the Magikoopas appear when a player lands on a Green Space. They shuffle the train cars by moving the first one to the very back of the train. In Bowser's board, the Magikoopa mixes up the candies of all the players. 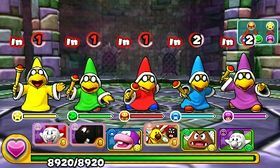 It is unknown whether these Magikoopas in the game are Kamek. But since two of the voices in Fun Bazaar are named after Kamek, the Magikoopas in the game are believed to be Kamek. Magikoopa's appearance in Mario Party 9. A Magikoopa is one of Bowser's minions in Mario Party 9, along with Shy Guy. In the Solo Mode, he appears randomly in the boards, and if one of them wins, the player has to play through the board again. But if they tie with or are defeated by a player, the player moves on to the next stage. When the player finishes Solo Mode, Magikoopa and Shy Guy will both become playable characters. In the PAL version, this Magikoopa is called Kamek. Magikoopas appear in Mario Party: Island Tour. Here, they act as background characters on the Kamek's Carpet Ride board. Alongside Kamek, a generic Magikoopa appears in Super Mario Party as a non-playable character. In the Wii version of Mario & Sonic at the London 2012 Olympic Games, a Magikoopa (possibly Kamek) appears before the start of the Dream Equestrian event, it looks through a telescope to view the finish and starting line, and then heads down to the starting line where the competitors begin. Throughout most of the event, it will use its magic to cast or summon fire rolling haystacks towards the players. At the entrance of cave, Magikoopa will also use its magic to cause speleothem to drop from the ceiling at the players, until it crashes into the wall. In the Nintendo 3DS version, Magikoopa also appears as a rival in BMX, where Sonic the Hedgehog faces him. The Magikoopa is also a ? Mark effect in London Party, it removes some of the player's stickers. Magikoopas reappear as enemies in Captain Toad: Treasure Tracker. The five Magikoopa colorations, as they appear in Puzzle & Dragons: Super Mario Bros. Edition. Magikoopas make an appearance as enemies in Puzzle & Dragons: Super Mario Bros. Edition. They appear in five different colors, which include red, blue, green, yellow, and purple, and each color determines their attribute; Fire for red, Water for blue, Wood for green, Light for yellow, and Dark for purple. Magikoopas are much smaller in this game than in other appearances. Magikoopas mostly appear at the tower courses in World 8, and they also serve as the boss of World 8- . Each Magikoopa has a skill that changes all Heart Orbs, along with the Orbs that they're weak against, to their own Orb attribute. All Magikoopas offer above average HP and ATK, while their RCV is low. Ordinary blue-robed Magikoopas are named Blue Magikoopas and are Water-attribute enemies, found primarily in the towers of World 8, first appearing in World 8- . As an enemy, a Blue Magikoopa attacks by firing a blast of blue magic at the screen, inflicting Water damage to the player's team. Their Skill, Water Trick, changes all Wood and Heart Orbs on the Orb field into Water Orbs. When defeated, it may occasionally drop a large coin worth 100 coins or a Grand Water Block of itself. It will always drop a Spiky Shell when defeated with a 10+ Combo attack. Blue Magikoopas can be found in World 8- , World 8- , and World 8- . As teammates, Blue Magikoopas have an HP rating of 5/6, an ATK rating of 5/6, and an RCV rating of 1/6. Their Max Lv. is 99. Their Water Trick Skill functions the same as it does when they appear as enemies. Blue Magikoopas use Spiky Shells and Grand Spiky Shells to raise their Skill levels. Blue Magikoopas may give RCV+ bonuses to other teammates when being depowered. Their Awoken Skill, Skill Boost, reduces the amount of turns required to first use Skills when entering a course. In version 2.0 of Puzzle & Dragons: Super Mario Bros. Edition, the player can transform a Blue Magikoopa into three other forms in which another Magikoopa accompanies it: Blue/Red Magikoopas, Blue Magikoopas, and Blue/Yellow Magikoopas. All three forms share the same Skill and Skill Item requirements, and have an HP rating of 5/6, an ATK rating of 5/6, and an RCV rating of 1/6 (with the exception of Blue/Yellow Magikoopas, which has an HP rating of 6/6). Blue/Red Magikoopas can be created by transforming a Blue Magikoopa with six Fire Flowers. This duo is a Water/Fire attribute teammate, and its Awoken Skill, Twin Target, raises ATK and attacks two foes for each of this ally's attributes that the player clears four Orbs for. Blue Magikoopas can be created by transforming a Blue Magikoopa with six Ice Flowers. This duo is a Water/Water attribute teammate, and its Awoken Skill, Water Boost, raises ATK of the player's Water attribute teammates when they clear a horizontal line of Water Orbs. Blue/Yellow Magikoopas can be created by transforming a Blue Magikoopa with six Super Mushrooms. This duo is a Water/Light attribute teammate, and shares the same Awoken Skill as Blue/Red Magikoopas. Several Magikoopas appear as spectators in the Bowser's Castle course in Mario Power Tennis. In Super Mario Chess, Magikoopas appear as bishops on Bowser's team. In the Super Mario Mash-Up Pack in Minecraft, Witches and Evokers are replaced by Magikoopas. Magikoopas have curved, beak-like mouths like average Koopa Troopas, but with more pronounced noses and fangs; in addition, they also have claws. They all wear glasses and wizard robes that cover all their body, leaving sometimes only their feet uncovered. Underneath these robes they wear a black undershirt. Most wear wizard hats (though Kammy Koopa wears a witch's hat). Their clothes can be found in many different colors, such as yellow, white, gray, and green, though the most common is blue. Prior to Mario Party 8, the only parts of a Magikoopa's robe that were colored white were the sleeve rims, with only a few exceptions in the Mario & Luigi series. From Mario Party 8 onwards, all the Magikoopas' hats have been given white rims. Magikoopas can summon broomsticks to fly on, and they all have scepters to cast their spells. Their scepters originally had white shafts with a blue ring and a red ring forming the base of the small green jewel at the end. The current scepter design is of a yellow (supposedly golden) shaft with a larger red jewel set in the end. In Super Mario Galaxy, they can turn into small white energy orbs to travel faster. They do this periodically during battle, making them harder to hit close-up. Magikoopas are stated to have shells during a quiz in the Wii version of Mario & Sonic at the London 2012 Olympic Games, although they have never been seen without their robes. Kamek, a Magikoopa, says in Mario & Luigi: Partners in Time the Mario Bros. are starting to "chap [his] shell" after taking Baby Bowser's treasures, so it is assumed Magikoopas have them. Tattle This is a Magikoopa. Magikoopas use magical rods. Max HP: 8, Attack Power: 3, Defense Power: 0 Magic attacks are no joke, Mario. You'd better take these guys seriously. Tattle This is a Magikoopa. Magikoopas are the elite magicians of the Koopa clan. Max HP: 11, Attack Power: 6, Defense Power: 0 Tread carefully, Mario! Their magical attacks pack a serious punch! They know many nasty spells. We'd better beat them before they can do anything crazy. 36 Log A Koopa wizard that'll use all sorts of magic. It breaks apart in multiple copies, so beat it as quickly as you possibly can! Tattle That's a Magikoopa. Y'know, a Koopa wizard. Max HP is 7, Attack is 4, and Defense is 0. It'll throw a load of pain our way while using magic to help its buddies. What a creep. And when there's only one of them, it splits up into multiple copies to mess with us. Stop this thing fast or we'll be in a world of hurt! Copy Tattle: That's a Magikoopa Copy. Yeah, attacking it won't do any good whatsoever. The real one's Max HP is 7, Attack is 4, and Defense is 0. Once you beat the real thing, the copies all vanish, OK? Look for the real one! Score 400 Items Card Type Uncommon Card Location(s) Card Shop; Catch Card/SP; Chapter 3-1: Found in 3D in the secret area via the furthest pipe on the right of the "Warp Zone" pipe trio in the underground area. Card Description This elite Koopa is an expert hexologist. It also has questionable taste in eyewear. Minion Quest: The Search for Bowser bio: Magikoopas dressed in blue. They tear into enemies from atop their brooms. Make a big play with a magical catch! A resident magician of the Koopa clan. The best of the Magikoopas, Kamek, once attempted to abduct the baby Mario Brothers, but Yoshi and Baby Mario thwarted his sinister plans. The magical powers of the Magikoopa also comes in handy in the game of baseball. A good pitcher, but an amazing fielder. Good stamina and good power to boot. A nice player with a good bat and glove. A steady guy with a decent bat and glove. For this subject's image gallery, see Gallery:Magikoopa. Kamekku From 亀 kame, meaning turtle, and マジック majikku (magic). Also the Japanese name for Kamek. This page was last edited on April 14, 2019, at 13:34.